Frank Henry Mason RI RSMA (1876-1965). 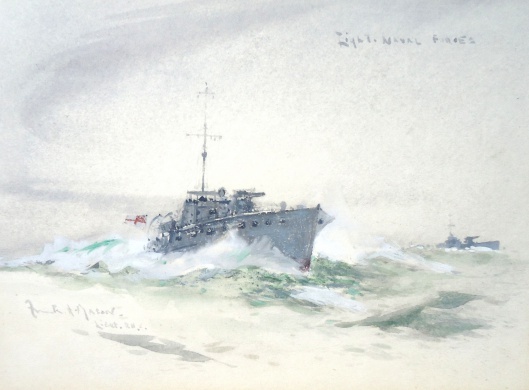 Watercolour with white bodycolour; signed (LL) and annotated Light Naval Forces (top right). Lieutenant Frank Mason RNVR (1875-1965) was himself in command during World War 1 of a Royal Naval Motor Launch (ML) such as he has painted here in this delightful little watercolour. Some 580 of these 80-88 ft long craft were originally built, mostly in US and Canadian yards from where they were shipped across the North Atlantic to Royal Naval bases in Britain and the Mediterranean such as Gibraltar, Malta and Alexandria in Egypt. They were petrol fuelled, were variously armed with a 3 inch gun forrard and Lewis guns and other heavy calibre small arms and depth charges, could knock up about 19 knots and had a ship’s company of around 8–10 - and they were "pigs to handle" we are told! Very lightly constructed with rudders too small to allow them to steer any sort of a course in a following sea, smelly (the petrol tanks were not liquid proof it seems! ), prone to considerable vibration and held "together" loosely with nails and planking, they found themselves undertaking almost every imaginable support task from landing clandestine forces on enemy shores, to minesweeping, harbour defence, anti submarine patrolling, coastal convoy defence and VIP transport. Over 30 MLs were lost during the war which considering their heavy and hazardous ad hoc employment is relatively few and speaks volumes for those who manned them. The officers were virtually always amateur yachtsmen and the like with temporary commissions in the RNVR; and the crews, like the officers, were amateurs too from every walk of life. They really did perform their myriad tasks with stoicism and gallantry - and not a little seamanship for these little boats were frequently employed in weather conditions and seas that were far outide their design specs! Frank Henry Algernon Mason was a young cadet at HMS CONWAY at Birkenhead before he trained as a marine engineer with Parsons & Co, the firm who had developed the steam turbine that was to revolutionise the power plants of naval and mercantile shipping around the globe. But increasingly art began to feature in Mason's life and with no little success! He exhibited regularly at the Royal Academy from 1902 and together with his commission in the RNVR he was appointed as an official war artist to the Admiralty during the Great War. The Imperial War Museum has some 55 of his paintings from this period and in 1973 the National Maritime Museum held a retrospective of his works.